Mary Ellis Ames (born c. 1887; died 27 February 1968 ) was Pillsbury’s answer to their competitor’s fictional woman, Betty Crocker. A real woman, Ames was the Director of Pillsbury’s Cooking Service. She worked for Pillsbury from at least 1925 onwards. From at least 1925 onwards, the Pillsbury Cookery Club was run in her name. To enroll, you collected and sent in vouchers from Pillsbury’s products. In return, you would get recipes or cooking technique tutorials sent to you monthly. You could buy a metal binder to put them in for 10 cents. The Cookery Club promoted the use of Pillsbury’s specialty flours such as Pancake Flour, White Corn Meal, and Sno Sheen Cake Flour, as well as of Pillsbury’s regular flours. 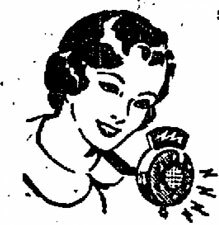 In 1933, Ames started a cooking programme on Columbia Broadcasting Service (CBS) Radio, called “Cooking Close-Ups”, matched by a syndicated cooking column also called “Cooking Closeups.” The programme continued until 1936, aired on Wednesday and Friday mornings. She also did the Pillsbury commercials for the Today’s Children programme broadcast on NBC’s Blue Network. 1934. Good things to Eat. Minneapolis, Minnesota: Pillsbury Flour Mills Company. Alternate pages in Hebrew, includes Sabbath recipes. Later, Pillsbury did introduce a fictional woman, Ann Pillsbury. She first appeared around 1943 as the author of 3 pamphlets: Ann Pillsbury’s Sugar-Shy Recipes, Ann Pillsbury’s Meat Miser Magic, and Ann Pillsbury Wheat Emergency Recipes. A comic strip ad featuring Mary Ellis Ames that appeared in the Ladies’ Home Journal in 1935. Tipton Tribune. Tipton, Indiana. 30 October 1925. Page 2. “Mrs. Mary Ellis Ames, 81, Route 3, was dead on arrival Tuesday afternoon at a Billing hospital. The body is at Smith’s Funeral Home.” — Billings Gazette. Billings. Montana. 28 February 1968. Page 33.